Travel the length and breadth of Sweden when you hire a cheap car with Bingo Car Rental. The largest of the three Nordic countries, Sweden borders Finland and Norway, and is connected to Denmark via the Öresund Bridge. Sweden’s east coast lies on the Baltic Sea, and is home to Sweden’s stylish capital city, Stockholm. Located in the south-central region known as Svealand, Stockholm is certainly worth a visit, though for many the real charm of Sweden lies in its many areas of natural beauty, with vast areas of wilderness, snow-covered mountains, pine forests and wonderfully clear lakes. Enjoy the freedom to explore this beautiful country at your leisure from the comfort of your own vehicle. Begin your travels in Stockholm on the east coast, collecting your cheap car rental on arrival at Stockholm-Arlanda Airport (ARN), located some 40km north of the city. 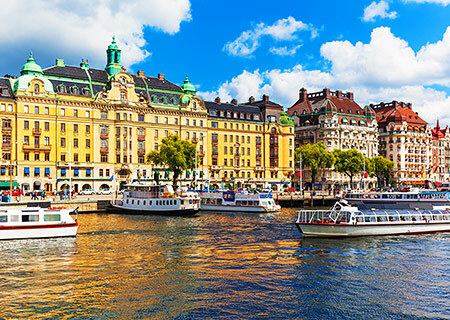 Stockholm is one of Europe’s most beautiful cities, sitting on fourteen islands on Lake Mälaren, with a fine collection of museums and a vibrant cultural and nightlife. Gamla Stan is the historic old town, Norrmalm is the business area, known at the City, and Ostermalm is home to many of the cities tourist attractions, including the National City Park. Over on the west coast is the port city of Gothenburg, Sweden’s second city and a friendly place with a vast canal network, grand architecture and elegant avenues and squares. You can fly directly to Gothenburg, landing at Landvetter Airport (GOT), just 25 km east of the city, or you could drive the 500 km from Stockholm, or even cross the border from Copenhagen in Denmark, just 317 km away or from Oslo in Norway, just 320km. Whilst you are in the Gothenburg region, make sure you take a ferry across to the beautiful islands that form the southern archipelago. Drive south along the coastline, passing through some of Europe’s best beaches, to the cities of Malmo and Lund. Malmo has a wonderful medieval centre, as well as having a reputation for being a party town, whilst Lund is a grand old university city. You should also get out to visit some of the great lakes of this region, including Vanern and Vattern, or drive north to the central region to Lake Siljan, regarded as Sweden’s most beautiful lake. As you travel through the central region, you will come across plenty of traditional-looking towns and villages, and along the eastern Bothnian coast you will find the cities of Lulea, Umea and Sundsvall. In the northern part of Sweden, inside the Arctic Circle in Swedish Lapland, you will find Sweden’s indigenous Sami population. Jokkmokk, a town located north of the Arctic Circle is the heart of Sami life and is a fascinating place to visit, or get out and about in your cheap rental into the beautiful wilderness, with endless pine forests, rivers and lakeside villages to be explored. Lapland is a popular winter destination for families visiting the home of Santa Claus, as well as with visitors in the summer wanting to experience the midnight sun. Kiruna and Gallivare are great bases for travelling in this region, or you could treat yourself to a stay in the famous Icehotel in Jukkasjarvi. Wherever you choose to stay, you are certain to enjoy a holiday of a lifetime in this amazing country. Bingo Car Rental is the place to come if you are looking for cheap car rental in Sweden. For a family vacation or road trip with friends, hiring a car is often the cheapest way to get around, giving you the freedom and flexibility to explore at your will. Find out how you can keep your rental costs to a minimum when you search online with Bingo Car Rental, so that you make big savings on your holiday. We are able to present you with prices that are up to 30% cheaper than renting the same cars directly from the car rental company, and by comparing prices from the leading car rental agencies such as Avis, Sixt and Europcar, we ensure you get the rental car you are looking for at the lowest rates available online. A compact car, supermini or small city car… whatever name you give it, this is the most economical car you can rent in Sweden. Ideal for couples, small families or city driving, not only are compact city cars the cheapest rental category, you will also find that these simple little run around cars keep fuel costs to a minimum. Look out for cars that deliver a good fuel economy (65 mpg being a good return, 80mpg is excellent), such as the manual transmission Volkswagen Polo with a diesel engine that delivers 74.3mpg or the Peugeot 308 Hdi, a great little small family car that delivers an impressive 79mpg. The Peugeot 107 and the Toyota Aygo are also reliable low price small cars, so choose a supermini with excellent fuel efficiency and find out for yourself how much money you can save. If you are travelling with a family and luggage, or are planning to travel long distances, a mid-size or full-size car is what you need. You can find cheap mid-size cars to hire in Sweden, including the Toyota Auris Hybrid and the sporty Hyundai i30 automatic tdi. The larger Toyota Prius Hybrid is also a good option, delivering an impressive fuel economy of 83.1mpg, saving you money on your gas. Other cheaper full-size cars include the Volkswagen Passat and the Mercedes C Class, giving you the space and comfort you need for a long journey whilst you reduce rental costs and petrol consumption. For travels with a large group, hiring a 7 seater minivan is probably the cheapest option. 7 seater cars come in a range of shapes and sizes, from the most economical 5+2 estate car up to a larger 7 seater MPV or minivan. If you are travelling with children, a 5+2 stationwagon is probably your cheapest option, such as the Peugeot 307 Wagon (with Sat Nav). The additional seats are ideal for kids, but not always suitable for adults and long distances, and you may need to consider a larger MPV or minivan. A compact MPV will be the lowest price 7 seater rental and recommended models include the Peugeot 508 5+2 TDI and the Volkswagen Touran 5+2. Renting a Minivan or People Carrier in Sweden is the cheapest way to transport 8 or more people, and you can take advantage of the great deals that Bingo Car Rental can offer online. The Chevrolet Spin is a simple yet stylish and comfortable 8 passenger MPV, the 9 seater diesel Fiat Scudo is an economical minivan, whilst for larger groups, the 12 seater Hyundai H1 delivers a great performance and excellent fuel economy. If you are planning a long road trip or a weekend in the country, a Toyota Previa Campervan rental might be the cheapest option for you, providing you with the freedom to travel in comfort and style, as well as an affordable, comfortable and safe place to sleep. If it is an off-road vehicle you are looking for, or an impressive sporty looking SUV, then find out what cheap deals are available on SUV and 4x4 hire. If you want to save money on fuel costs, an SUV won’t be as fuel efficient as a subcompact car, but there are some SUV’s that will deliver more than 50mpg, including the manual Volkswagen Tiguan Diesel and the crossover SUV Nissan Qashqai Diesel. For a larger 4x4, the Range Rover Evoque or the BMW X3 also deliver a good fuel economy and are both reliable, safe and practical 4x4’s, ideal for family vacations and off road adventures. For a cheap way to hire a luxury car, booking online with Bingo Car Rental is your answer. We hire the same high quality luxury cars as the specialist luxury car rental operators, but at much lower prices, and whether you want an exotic car hire for one day for a wedding, or a weekly rental for a special holiday, we have the ideal low cost luxury car for you. Choose a Mercedes E Class, an Audi A8 or a premium Jaguar XF. A Bentley Flying Spur makes the perfect wedding car, whilst an Audi TT Convertible will certainly turn heads wherever you drive. With Bingo Car Rental you can choose from cheap car rental offers - various cars from many car hire categories - and book online in the easiest and safest way. By comparing rental deals from hundreds of reputable car rental companies in Sweden, Bingo Car Rental is able to present competitive deals of cars to hire in thousands of locations. Hire a low priced car and drive safely with Bingo Car Rental!